Crowdpolicy, a pioneering company in matters of open – participatory government and open data technologies, has designed, developed and implemented the Online Consultation Platform for the Municipality of Pireaus. The Municipality of Pireaus launches the Structured Public Consultation Mechanism for proposals and ideas to be implemented, in the context of shaping and highlighting in a participatory way its needs and priorities in terms of municipal projects and actions. 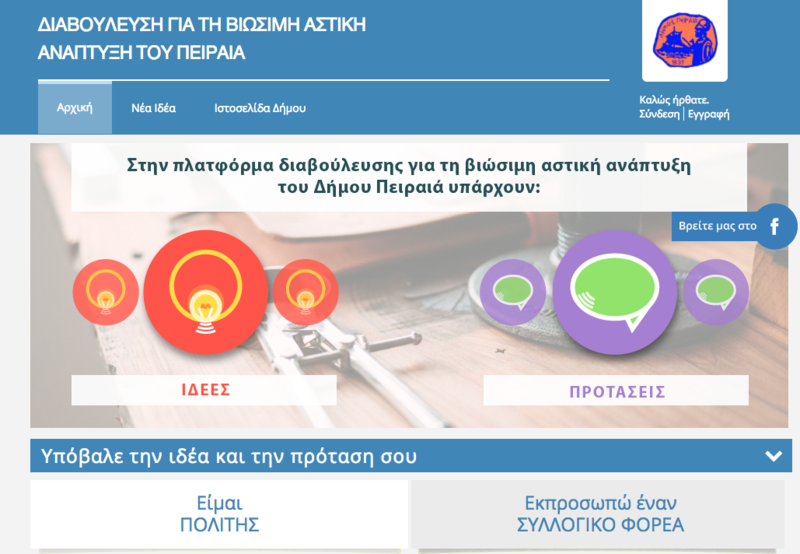 The Consultation Mechanism is provided to the public through a modern digital tool, the online platform that is accessible at the link http://planpiraeus.gr/. The platform invites all interested citizens, the residents of the Municipality as well as collective bodies to submit their views on the projects and actions that are proposed by the Municipality or propose their own ideas on projects to be implemented. In addition to proposing ideas, the users of the platform have the opportunity to comment on the already posted proposals in order to start a constructive dialogue on various topics concerning the Municipality and the provided services. In addition, the Consultation platform will serve as the main tool for the participatory shaping of Developmental Projects and Actions Programs, as well as for highlighting and visualizing the needs, ideas and proposals of the local community. Through the Consultation platform, the Municipality promotes and strengthens the involvement of citizens and bodies, the rationale of co-shaping actions that make up its strategy, while at the same time it supports collective decision-making on the design and implementation of actions. The online platform is based on innovative and participatory technologies (Crowdapps) that promote the active involvement of citizens and collective bodies at local level. This is why the Municipality launches the participatory Consultation Mechanism and invites all stakeholders to participate.